RGN editor Jack Kennedy went to visit the site where the Dolwin3 grid connector is being built in Northern Germany and sat down with Patrick Plas, general manager, HVDC and FACTS, Grid Solutions from GE Power to discuss the impact this technology could have for offshore wind energy in the future. In mid-June the DolWin3 offshore converter station was launched from Warnemünde and made its six-day journey along the German and Danish coastlines to its final position, 80km offshore, where the team began the installation onto the previously installed subsea jacket. DolWin3 is a 900MW capacity grid connection which will convert alternating current (AC), a form of electricity which travels inefficiently over long distance, to direct current (DC) in order to effectively transmit clean energy from a cluster of wind farms in the Southwestern part of the German North Sea. 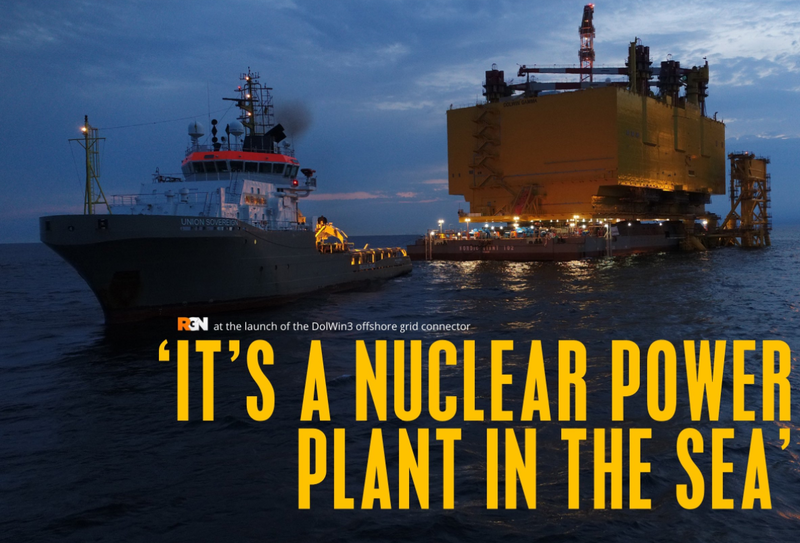 “The installation of the platform DolWin gamma is an important milestone for us,” Plas said after the installation. “DolWin3 is GE’s first offshore HVDC project. The technology represents a crucial turning point for offshore wind, renewables, and how we are able to move that energy efficiently from where it is being generated to the customer, with significantly lower losses over long distances. A high voltage direct current (HVDC) transmission line will connect DolWin3, which will sit 80km off the German coast, with an onshore converter located in Dörpen where it will then be converted back to AC which can power a city the size of Hamburg – or roughly a million households. General Electric’s Grid Solutions division is leading the construction of this deeply technical construction, contracted by German energy company TenneT which will use the system to supply energy across Germany. Plas says it is the technical and transformative nature of the project which attracted GE to participate in the project. Arriving at the Nordic Yards ship building site in Warnemünde, where Dolwin3 has been constructed and is undergoing final preparations before being towed out in mid-June, the first thing that strikes you is the sheer size of the HVDC system. At 76 metres tall and painted in a distinct yellow, DolWin3 towers over the shipyard. The platform is the length of an American football pitch and weighs a gargantuan 18,450 tonnes. The supporting structure for DolWin3, known as the ‘jacket’, has already been shipped out to location and when this platform is towed out there is not much room for error when it comes to place the huge construction on its pillars. Despite the size and weight of the grid connection there is only 50cm of leeway when it is attached to the supporting legs. As this technology develops, Plas says the two primary objectives are to reduce both the size and cost of building and installing a platform like DolWin3. Plas noted that as wind farms continue to bring down the cost of energy generation – with recent auctions seeing cost-parity with conventional grid electricity – making sure that energy can be delivered at the same cost through the supply chain is crucial. For this technology to continue to change the way offshore renewable energy is delivered to mainland grids it has to be refined to make it easier to install, cheaper and with multi-faceted applications – Plas hopes it will also lead to an increase in the number of wind farms being built. “It’s in all the technical economical studies, it’s about making the business case fly in a lot more cases. If you lower the entry barriers then suddenly you have opportunities which are much more likely than before,” Plas asserted. Currently there are cases of wind farms which are not economical as they are too far away from shore to have an easy, efficient connection without the use of HVDC. At the moment it is more expensive, but Plas stresses that if the prices falls it will open the door to a raft of new wind projects. The future for GE and HVDC is already happening. Plas is already busy going forward with bids for future projects, for example DolWin6 – another project for Tennet, and he is aiming to continue to reduce the size and cost of offshore converters as the technology matures. The successful installation of DolWin3 represents a major milestone for both TenneT and GE in terms of offshore wind energy transmission, but looking at it with a broader scope this type of technology can transform the way electricity is distributed all over the world. The fundamental role of the converter is for the efficient transmission of electricity over long distances. That can be for green energy, coal-powered energy or nuclear, and the model can be applied to countries that struggle to transmit energy to very remote or distant regions which lack power infrastructure. For big countries such as Brazil, India, China and even the continent of Africa, which all suffer from energy poverty in the remote areas, the efficient transmission of electricity at low costs and widely available could represent a step change in energy development. “We [at GE] are very focused here on green energy and wind but it goes beyond that. Its about transmitting energy and giving power to people who are needing it to develop. That’s the other face of the story which is less about green energy and more about development,” said Plas. Jack Kennedy was speaking to Patrick Plas at the GE/TenneT press event for the launch of DolWin3 in Warnemünde, Germany.